Greeting and salutations everyone; once again it is I, Chess the purebred border collie, filling in for the guy I live with, who says he doesn’t have anything worthwhile to say, whereas, I, of course, do. You may remember me from such posts as “Three Percent Humidity” (when there wasn’t any subtropical moisture) and “Disgrace Of The Week”, among others. Here I am in a characteristic pose. That’s the canal on the right, and the creek in the upper right, where the trees are. 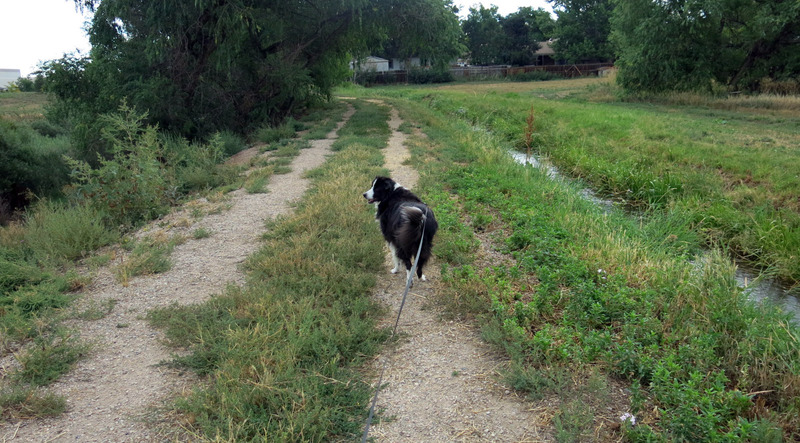 The creek goes under the canal, through a culvert, and flows into Bear Creek, which flows into the South Platte River, which joins with the North Platte, then it becomes the Platte, which flows into the Missouri River, which then flows into the Mississippi River, which then flows into the Gulf of Mexico. Cool, huh. I have an announcement. My blog has been nominated (thank you, thank you, thank you) as one of the best garden blogs of 2013. It doesn’t say anything about border collies and other herding dogs being able to vote ten times. We discovered this here. You can tell, of course, that the blog has become better now that it’s focused mostly on me. Well, sort of focused, if the guy I live with could use his camera. 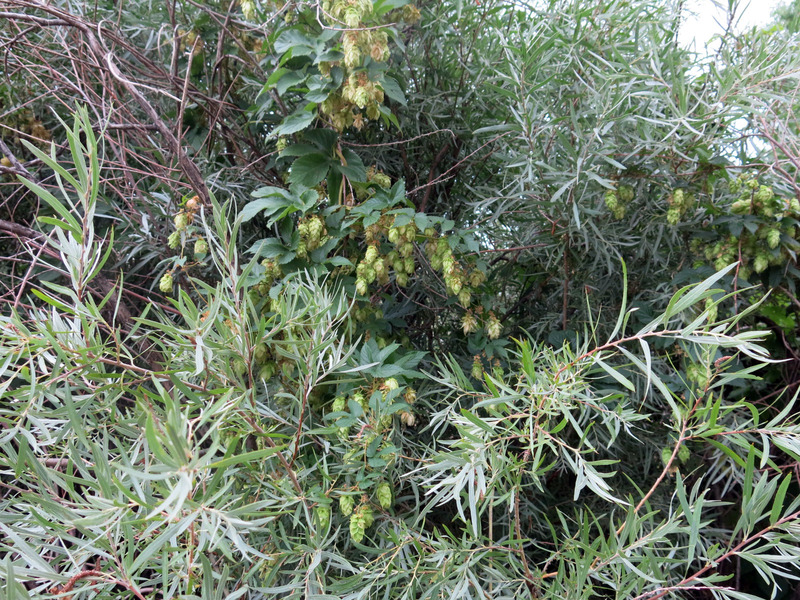 which is a hops vine dangling through the willows on the bank of the canal, and the guy I live with would write something like “a perfect companion plant to rabbitbrush” and get no response at all. It really doesn’t deserve one, does it? There were going to be two announcements. 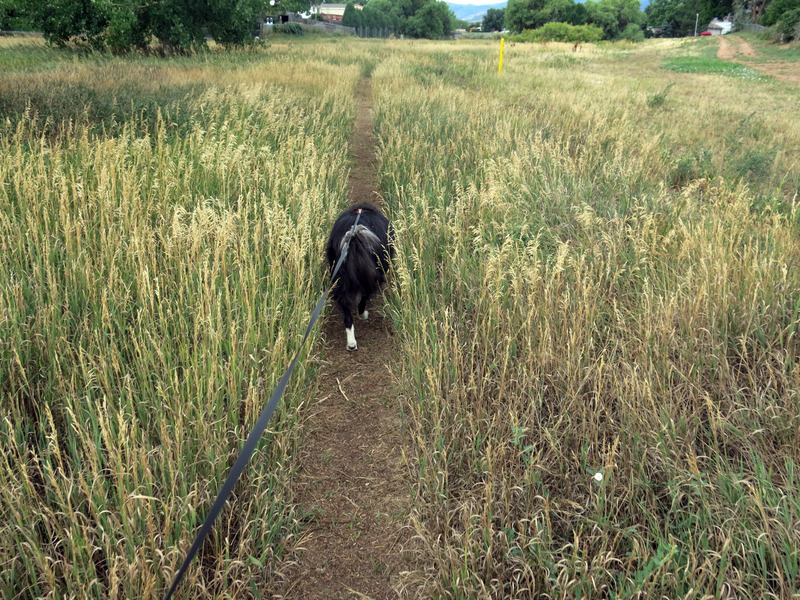 The reason the guy I live with brought his camera on our morning walk was that he was going to try (unless he chickened out) to take a picture of the enormous spider we see on our walk, and not post it on the blog, but on his Photobucket page, but it wasn’t there. I was kind of relieved, because I didn’t want to get too close to it. This is me walking back. And here I am walking down the creek path. I decided not to go all the way down it, because I thought going back home to post this announcement was way more important. Although it may not seem that way to you at times, I think that the man you live with is, in his own way, trying his best to pull his weight. In the meantime… Write on, Chess! Write on! Thanks. I pull the weight of the guy I live with, as you can see from the pictures. Thanks, there are a lot of things about the guy I live with which I find humorous. He might not agree. So well deserved. You’ve become rather a hero. Why thank you. The guy I live with acknowledges the fact that he owes me a lot. I just voted for Best New Garden Blog, Chicago style: early and often. I don’t even garden, plus I’m a cat person, and I am hooked on this blog. 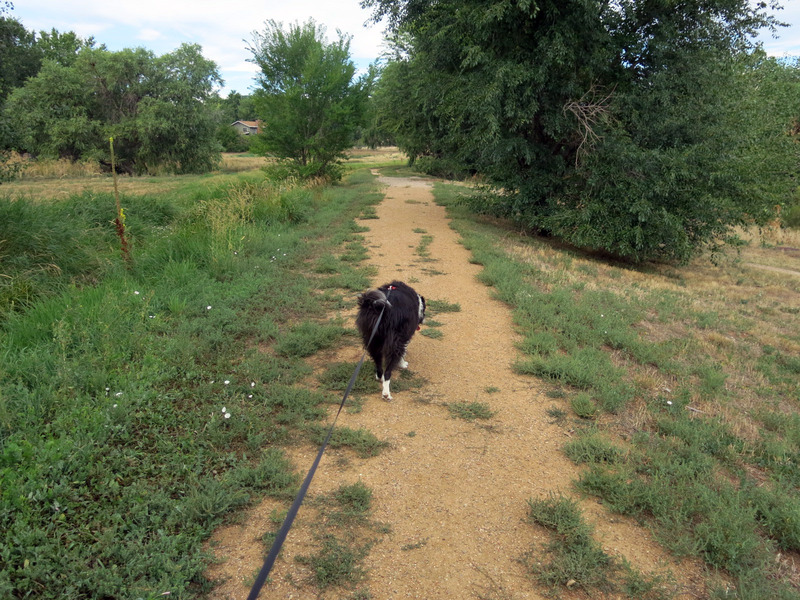 Is that a Colorado levee there by the canal? Cute. Why thank you. We can’t be cat people because of their general smelliness (so I hear), and the fact that what used to be The Long Border is now a huge pile of sand and gravel …..
Also the open door business. Bad things could happen. The canal comes from Turkey Creek, and goes east somewhere. The guy I live with Googled it but it vanishes. At one time there was an abandoned farmhouse to the north, and the sluice were the huge spider is was for that. He says that there were woods there, and with the farm house, it was very Blair Witch-y and the guy I live with got all creeped out when he first saw that movie. If there is any justice in this world, you will win. Well, thanks. The guy I live with really doesn’t want to win anything. He couldn’t accept any awards because that would mean him flying somewhere and me staying in a kennel, which he promised he would never, ever do to me. Nor would he leave me with other people who might not understand how the world revolves. Don’t worry, these are blog awards. They will give you a shiny badge to put on your blog sidebar and a pat on the head. A badge. Border collies like badges. My grampa Flurry had a badge; really, a blue ribbon that said “Herding Certified”. The guy I live with got a badge once. When he was in kindergarten, all the kids got those colored stick on stars for being good in school, or for outstanding achievements in the field of excellence. That sort of thing. Only one kid didn’t get any stars. Guess who that was. He started to get a complex or something. So his mommy called the teacher and complained, and the next day the guy I live with came home with colored stars plastered all over his forehead. That was a really long time ago. Really long. Before color TV, even. Songs on the radio were things like “Hound Dog” by Elvis Presley. Congratulations! So well deserved. I always check your blog first to see if there is a new posting, and I feel a little rush of happiness every time there is. Thanks for keeping them coming. You two are a fine team. Thanks. The guy I live with couldn’t do it without me. Congrats, you certainly deserve to win. Thanks. The guy I live with says he won’t fly anywhere and leave me behind, though. It’s the thought that counts, of course. Voted for you and that guy, Chess. Good on ya! Thanks. Proof that we purebred border collies can save the day. I say “purebred” all the time because my mommy said I didn’t look like the other border collies she had and that I looked more like a goofball. Of all things. I lurve myself some goofball, and I am also fond of garden blogs of content and wit. Luckily, I know just where to find both. Congratulations. Thanks, well, give a task to the smarter of two creatures and this is what you get. Hello Chess. I only started reading the blog you shepherd for the guy you live with in July, but have become quite enamored. (In fact, I became concerned when you didn’t post for a week!) I’m so pleased your getting the recognition you are due, even though the guy you live with will not leave to accept his badge in person. I think the reason I didn’t post was because nothing was going on. Sometimes that happens. Keep up the good work, so we don’t have to get involved. Growing cactus in pots is an especially good idea, but only if they’re not hugely stabby and at nose level. The hardy ones can stay in pots outside all winter here. Am I the only one who wants to see the spider? Could be. There isn’t any picture of it, because it’s big and scary.